I just finished watching Arctic Clutch. He doesn't go as far as I'm planning to with Coast Cubed and he does it in a more alcohol fuelled young man's way, but he does shed some light on travelling in the far north. From the video it's hard to tell whether 150km/day on the Dempster Highway is difficult, or difficult because he's hungover. He does mention how expensive hotel rooms are up there though, which is helpful. 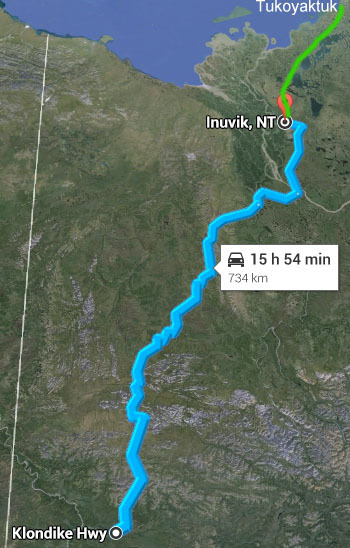 The key to being able to access the arctic coast in Canada and enable a coast to coast to coast trip is the completion of the Dempster Highway up to Tuktoyaktuk. It looks like it will be completed by 2018. A summer 2018 coast to coast to coast epic adventure, sounds like a plan! I'd the first person on two wheels to complete this trip. Anyone interested in joining me? Next to the extreme distances involved (the Earth's circumference is just over 40,000kms, this trip is over half that, all in one country! ), the hardest part of this trip is the ride north to the Arctic Ocean. I'd originally thought that since eighteen of the twenty thousand kilometres of this trip will be on pavement, I'd get a bike focused on that task. I'd stop in Dawson and prep the bike for the rocky portion of the trip with an engine guard and some dual purpose tires tough enough to handle a couple of thousand kilometres over rocks. An argument could be made for an adventure bike for this, but unless it's a very road focused adventure bike I wouldn't consider it. Having to put up with a tall, wallowy, wrong-tired, road-awkward bike for just 10% of the trip still seems wrong headed. What is vital is a bike that can handle high kilometre paved road days that wouldn't fatigue me. Having seen Nick Sanders double Pan-America Highway run on a Super Ténéré, I'm thinking that a multi-purpose bike might work better, though with having to deal with Central and South America, Nick had a lot more unpaved road to deal with. There are, however, a number of 'adventure' bikes that are much more comfortable on pavement and can eat huge miles easily. I'm still always thinking about lighter weight bikes and don't want some litre plus monster to lug around. With that in mind I'm rethinking choices for this trip, especially if I've got a couple of years to get my ducks in a row. An early favourite of mine is the Triumph Tiger. Described more as a good road bike with some off road ability, it would be putting the priorities in the right order but would still have no problems with the Dempster Highway. Being made-in-England myself, I'd enjoy doing Canada's first coast to coast to coast ride on a compatriot. I was all set to be a Triumph guy from the start, but my Ninja has snuck up on me, and Kawasaki offers some interesting long distance options. I've already thought about the Kawasaki Concourse, which would handle the big miles in an athletic but capable manner. Then there is the odd, but Cyclon-looking Kawasaki Versus (the odd cousin of my Ninja), which looks like it could handle the Dempster. 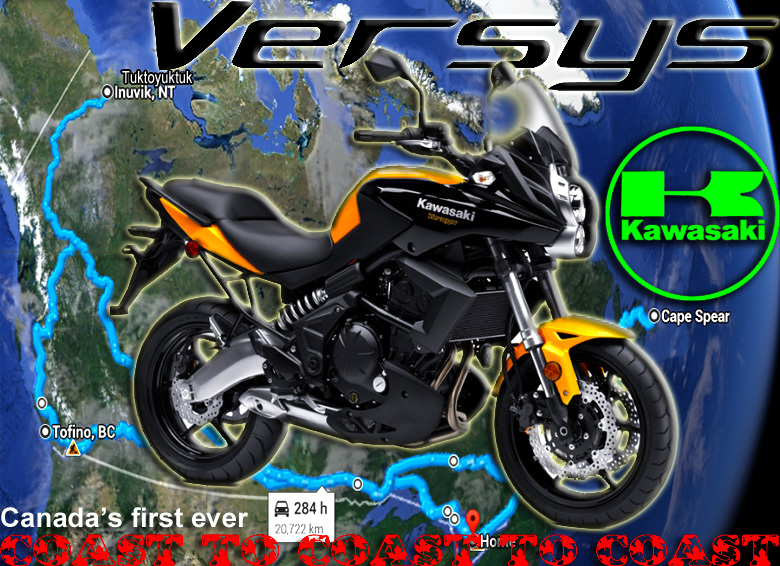 Maybe Kawasaki would like to bring the Versus out of the shadows and make it the first bike to ride coast to coast to coast in Canada. Since I've got a couple of years to work this out I'll pound the pavement and see who wants to be involved. OLN Canada should probably be on the ground when someone completes the first coast to coast to coast Canada ride. Isn't this like finishing the railroad (finally)? Canada is, at last, truly a three coast entity and we can all enjoy it. Over twenty thousand kilometres of travel without crossing an international border. Canada really is something rare in the world, enormous and unfinished... especially to the north. Time to get the Versus out of the shadows and make it the first bike to ever go Coast to Coast to Coast in Canada?